The average real estate attorney fee for a purchase or sale transaction in NYC is $2,000 to $3,000. Lawyer fees can be as high as $5,000 for a more complex transaction and for new developments. There are also light-touch, discount lawyers available who charge flat fees as low as $750. 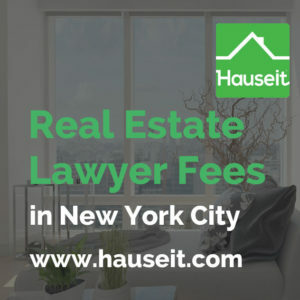 We answer the following questions about New York City real estate attorneys in this article, such as: Are fees paid upfront or hourly? Do you have to sign an agreement? There is also a sample real estate attorney Engagement Letter at the bottom of the page. 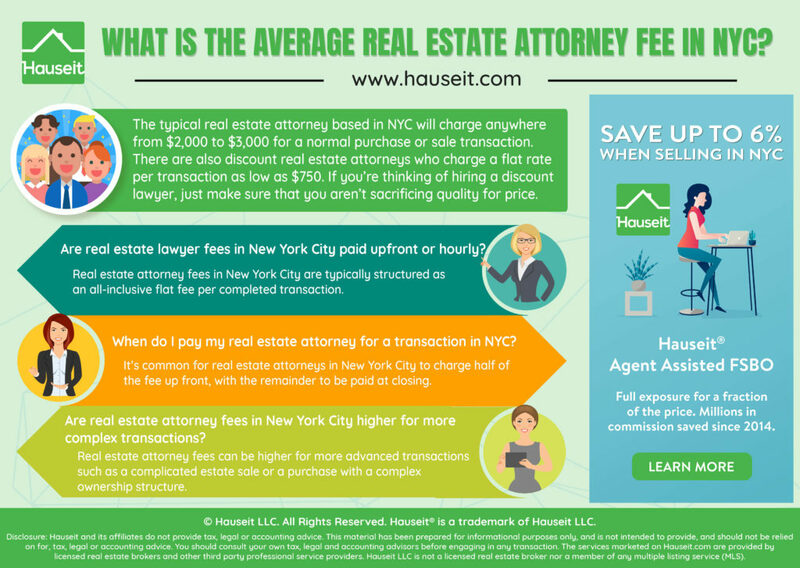 Are Real Estate Attorney Fees Charged Hourly? Do You Pay Real Estate Lawyer Fees Upfront? The typical real estate attorney based in NYC will charge anywhere from $2,000 to $3,000 for a normal purchase or sale transaction. The flat fee rates you are quoted will vary based on the complexity of your real estate transaction. Rates are higher for real estate lawyers based in New York City vs attorneys based in lower cost locations such as Long Island or the Hudson Valley. There are also discount real estate attorneys who charge a flat rate per transaction as low as $750. Pro Tip: It’s critically important to work with a real estate attorney that specializes in real estate deals in New York City, and not someone who dabbles in a variety of fields. Read our guide on questions to ask your real estate attorney before you hire them, or simply contact us for a referral to one of the city’s most experienced real estate lawyers! No. Real estate attorney fees are typically structured as a flat fee per completed transaction. You should be careful of any lawyer asking for hourly pay for a real estate deal as that’s a sure sign that the lawyer does not specialize in real estate transactions. This will sometimes occur when buyers or sellers insist on using their family lawyer, someone who has worked with their family on a variety of issues from pre-nuptial agreements to incorporating a business. Such a lawyer who claims to do a bit of everything will usually not have much experience in real estate transactions. Pro Tip: If you do insist on working with a lawyer who doesn’t specialize in real estate transactions, make sure to read our guide on questions to ask your real estate attorney before you hire them and make sure they can explain to you in detail the NYC closing process. Real estate attorney fees are typically taken at closing and will be part of the closing costs mentioned in your lawyer’s closing statement. Some lawyers may negotiate for half or some other portion of the fee to be paid upfront, with the remainder to be paid at closing. Some lawyers may ask for an engagement letter to be signed outlining the terms of such an agreement as this. Pro Tip: Most experienced attorneys who specialize in real estate will not even bother with an engagement letter. That’s because their business lives off of referrals and they will never go after a client in small claims court over a few thousand dollars. Not only will that be not worth the time spent in NYC’s court system, the negative reviews and publicity will not be worth it. Furthermore, if the transaction closes, the lawyer will be there to ensure that they get paid. Real estate attorney fees can be higher for more complex transactions that will simply take more of the lawyer’s time. For example, real estate lawyer fees could be higher for a complicated estate sale with heirs that are hard to track down and a power of attorney involved. Or the real estate attorney fees could be higher for a purchase involving a foreign buyer and a convoluted corporate structure. Pro Tip: Make sure your lawyer has negotiated a condo contract in NYC before. And if you’re buying a coop in NYC, make sure they have familiarity with sublease agreements in case you’re able to and need to rent out your co-op later. Real estate lawyer fees can often be doubled when buying a new construction home in NYC. That’s because developers typically expect the buyer to pick up some of their closing costs such as NYC and NY State transfer taxes and the sponsor’s attorney fees. As a result, a buyer of a new construction condo or coop may end up paying for both their own attorney fees plus the seller’s attorney fees! Unfortunately for buyers of new development condos and coops, the rate charged by the sponsor’s attorney is decided by the sponsor. The rates charged by sponsor’s attorneys have been inflating quite a bit as of late, and it’s not uncommon to see $3,000 to even $5,000 charged by the sponsor’s attorney. Pro Tip: Fortunately, just like everything else in real estate, the sponsor’s closing costs are negotiable with the assistance of an experienced buyer’s agent. Furthermore, you can save on your buyer closing costs with a discreet closing credit from one of our veteran buyer’s brokers. 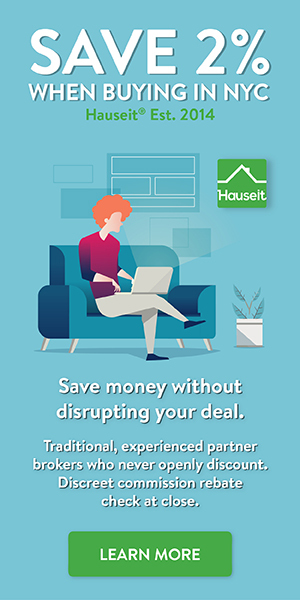 Not only will you have an experienced guide when buying a home in NYC, you’ll also be able to earn part of the built in commission paid by the seller! This letter will serve to confirm that you have retained our firm as counsel to represent you for the purchase of the residential condominium unit on the third floor in the building located at 555 Fifth Avenue, New York, NY 10024. We agree to bill you at a flat rate of Three Thousand Dollars ($3,000.00) for negotiation of the contract of sale and attendant riders; review of the due diligence materials prior to contract signing, including review of the offering plan, building financial statements, condominium board meeting minutes, if any, and any other relevant materials; advice and counsel regarding all other directly related matters prior to closing, including but not limited to the tax impact of the transaction; and, attendance at the closing. You agree to pay the fee in two (2) equal installments, the first to be paid upon execution hereof and the balance to be paid at closing. We both recognize and acknowledge that we may agree to extend our representation of you to include items outside the limited scope described hereinabove; in such instance, we will execute a supplemental engagement letter setting forth the scope of work and the fees to be charged. Provided our representation of you remains within the limited scope specified above, at or prior to closing you agree to pay our fee in full plus any and all disbursements, costs or expenses we should expend on your behalf, provided such disbursements, costs or expenses are agreed to in advance. Should it become necessary, you will be responsible for uncollected fees, any collection costs, and attorneys’ fees incurred by this firm in collecting any unpaid and outstanding balances then owed. We shall have a lien on all of your documents and any of your money in our possession for the payment of all sums due us from you under the terms of this Agreement. We do not charge for the cost of disbursements we incur on behalf of our clients in the ordinary course, such as postage, telephone, telecopier, photocopying and local transportation; however, other disbursements, costs or expenses we expend on your behalf that are agreed to in advance shall be billed to you and you agree to honor such bills directly. While we will expend our best efforts on your behalf, you acknowledge that we cannot offer any guarantee of a result with regard to any matter referred to us. We look forward with pleasure to working with you. Please acknowledge your agreement in the space provided for your signature below.